The project celebrates Rotary’s Centenary of 2005. The Rotary Club of Ayr launched a major four-year community project in 2003 to survey a possible Coastal Path route, obtain the consents of farmers and landowners, engage the support of our two local councils, and raise funding for the project. Now completed, the Ayrshire Coastal Path provides Ayrshire folk with healthy exercise and an opportunity to experience and cherish their own countryside, and attracts walking visitors to our beautiful and historic county. By linking existing natural beaches and walkable shore terrain via field-edge paths, wrack roads, existing farm tracks, promenades and old railway track, only short stretches of path needed to be restored or built. Rotary International is a community-based, worldwide Service Organisation with over a million members in 165 countries. 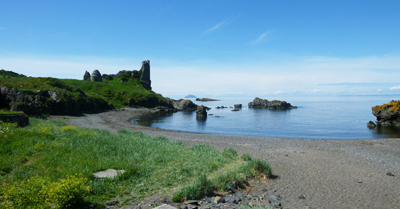 As well as comprehensive details of the route, the Official Guide Book contains a wealth of information for the general public on the fascinating history, geography and natural history of the Ayrshire Coast. All proceeds from sales of the Official Guide Book are dedicated to Rotary overseas charity projects. Click here for more information and to purchase online. Stage 8 Troon to Irvine follows, from Troon harbour, Barassie shore into Irvine Beach Park and Harbour, a distance of 10 km = 6 miles, taking a time of 3 hours. Full details in the guidebook. Stage 9 Irvine to Ardrossan takes the walker up to Irvine Low Green, then via NCN7 north past the Town’s Moor and Garnock Floods SWT Nature Reserve to Kilwinning, leading thereafter to Ardeer, Stevenston, Saltcoats and reaching Ardrossan Harbour and Marina, a distance of 17.5 km = 10.8 miles, taking a time of 4.5 - 5 hours. Full details in the guidebook.